Welcome back to the fantabulous Woman Crush Wednesday, the most fun and delicious day on the calendar. 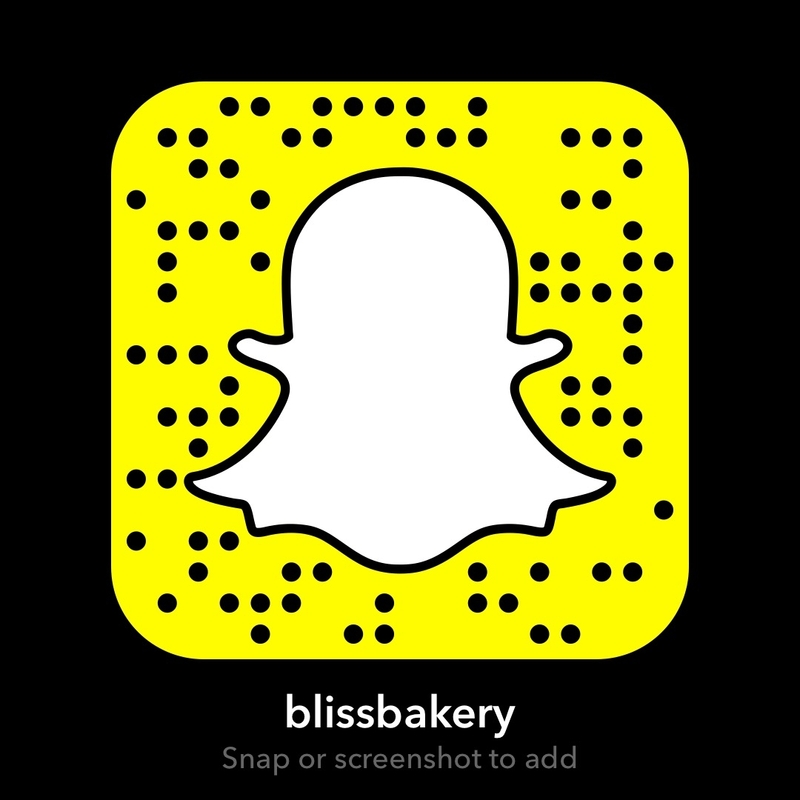 Each week we shine a well deserved light on a female foodie in the culinary world and recreate one of her recipes for a snapchat tutorial (username: blissbakery). And today is especially wonderful as my granddaughter was able to assist me in the kitchen! 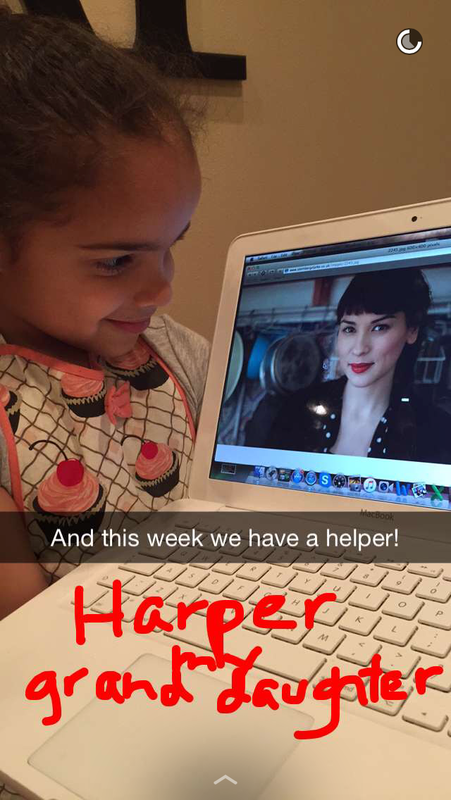 Normally I am apologizing for my bad singing and dancing, but Harper is not only a great singer she can also bust some moves. A fun cooking adventure indeed! 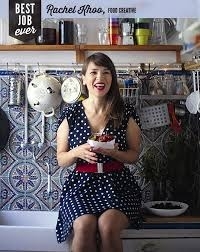 This week’s honoree is the gorgeous and oh so talented chef Rachel Khoo. 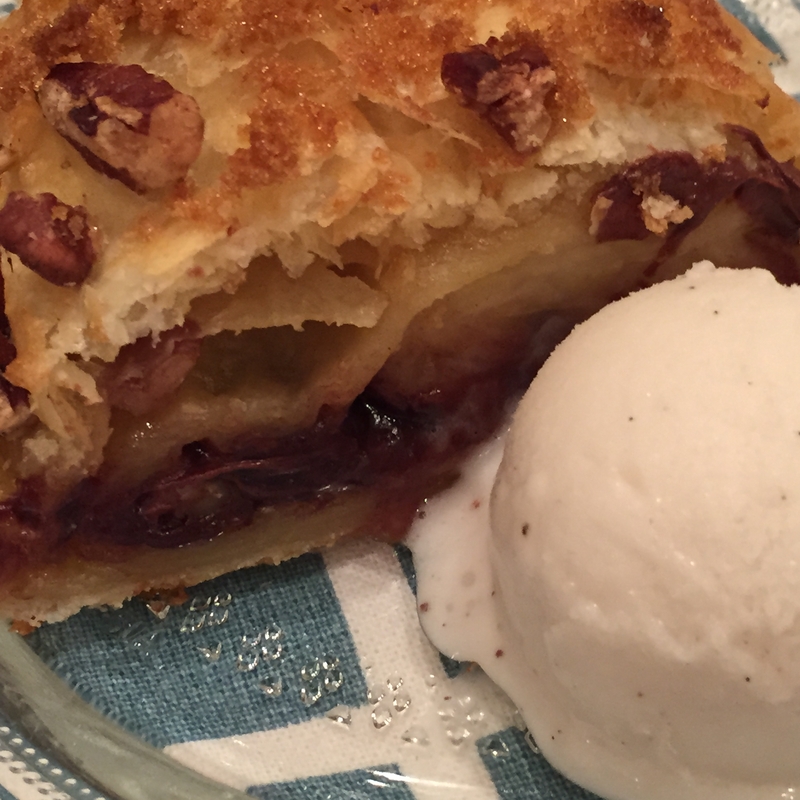 Though Rachel is English, she studied pastry at Le Cordon Blue in Paris, so we figured why not make one of her tasty desserts! But this isn’t just any dessert, this is a decadent hot chocolate and banana caramelized taste explosion wrapped in a buttery and flaky puff pastry. While Rachel certainly has the skill to make homemade puff pastry, she actually chooses to use ready made pastry for this recipe. I love that someone so accomplished in her field, is still down to earth. She helps the rest of us with a little short cut in the kitchen. That way we can spend more time with our guests having the old chat or two. Certainly something she would have done during her years living in Paris. But just because this recipe is simple doesn’t take away from the complexity and perfection of flavor combinations. Quite honestly, it is heaven on a plate! Especially with a side of vanilla ice cream! Now we are talkin! Place the sheet of puff pastry in front of you and brush with egg wash. Sprinkle with nuts and a tablespoon of sugar. 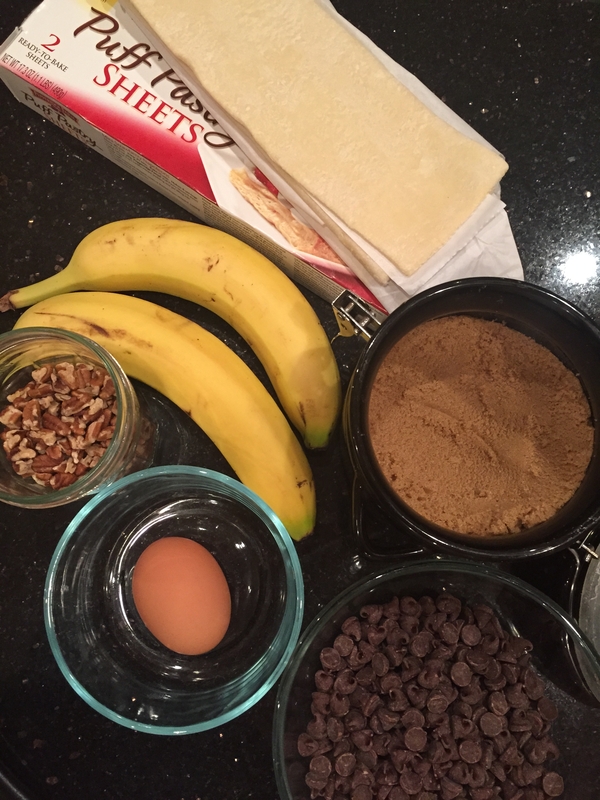 Add the bananas in a row followed by the chocolate broken in pieces. Harper has them nearly ready for the oven! Roll up and brush with egg on the top. Sprinkle with the remaining nuts and sugar. 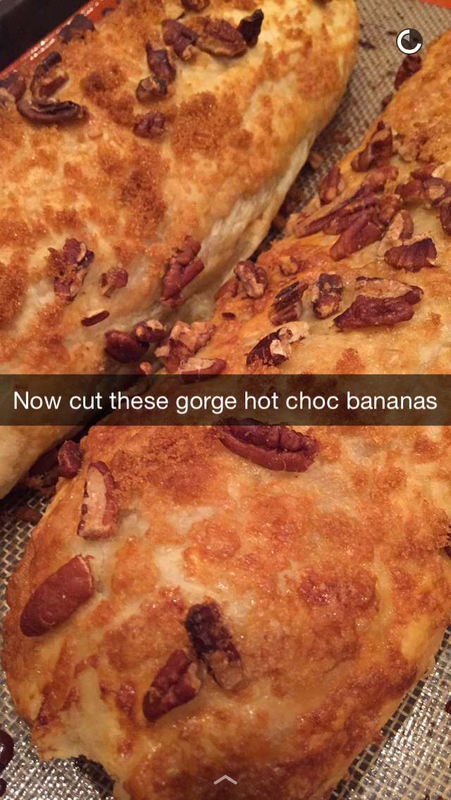 Place on baking tray and bake for 20 – 30 minutes or until golden and puffy. Best eaten warm and extremely delicious with ice cream or freshly whipped cream! As if Rachel isn’t busy enough with cooking, writing, and filming, she is launching a life style magazine. But it isn’t a surprise really. She studied art at university in the U.K. and worked in fashion PR. She is a world traveler and shares her adventures on her Instagram account. So in essence it is the likely next step. The sky is the limit for Rachel. Her uber popular The Little Paris Kitchen Book let the novice into her tiny culinary corner in the mecca of French food to tackle traditional recipes with a twist. The fact that when she moved to France she didn’t even speak French says volumes about her tenacity and courage. 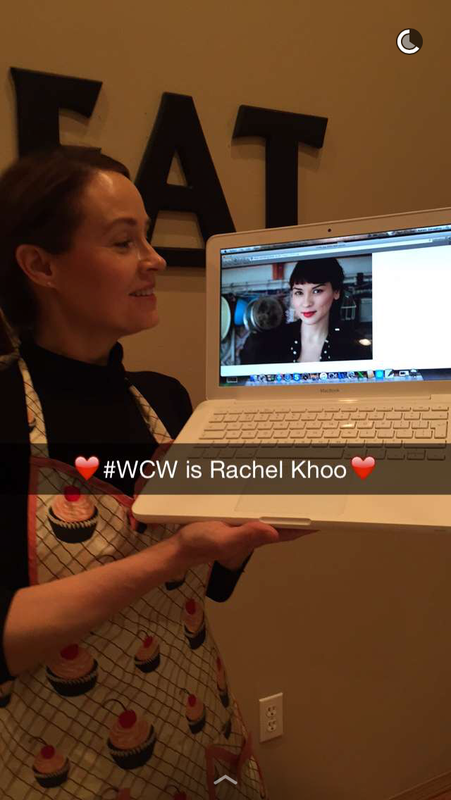 Wow, Rachel you are a shooting star and we are so happy to have you as our #WomanCrushWednesday! We wish you the best in your new endeavors and thank you for being an inspiration and role model. 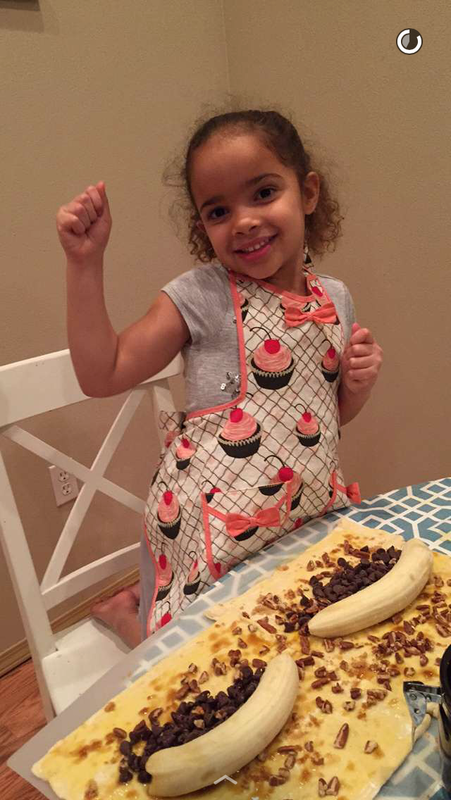 You are beautiful inside and out and we are so eager for more of your culinary creations! YDP + granddaughter Harper too!